Apple has submitted more detailed plans to the City of Cupertino, outlining its vision for its new 175 acre “Spaceship” campus in the area and including improved renderings to show just how its headquarters will look once completed in 2015. The proposals, posted by the city, includes plans for an office, a research and development building totalling 2.8 million square feet, a 1,000 seat corporate auditorium, a fitness center, central plant, parking and new 300,000 square feet research facilities. Apple will be subject to an environmental impact assessment which will monitor traffic, noise, air quality levels and allow local residents to comment. Apple believes its new campus will maximise efficiency and convenience to Apple’s employees, providing a co-location of services and consolidation of employees in a single distinctive office research and development building. The building itself will hold as many as 13,000 employees and will attempt to generate its own electricity on site, reducing its dependency on local power resources. 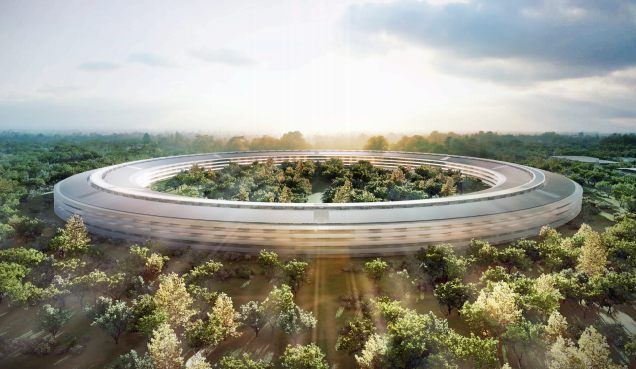 Cupertino Mayor Gilbert Wong’s told press and residents at a press conference in June that “The mothership has landed here in Cupertino,” responding to Job’s proposed new “mothership” Apple campus.